The new AirPort Extreme was quietly released by Apple this week with no mention of new features, but it actually has increased power output for increased Wi-Fi signal strength and range. 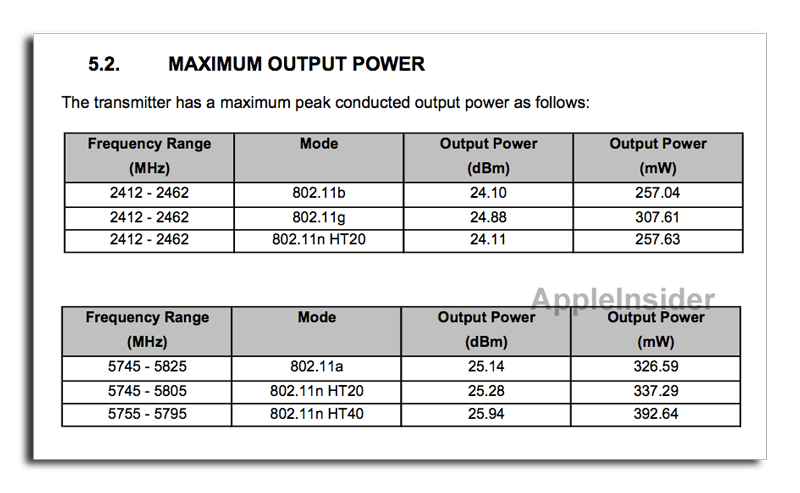 When broadcasting 802.11n Wi-Fi in 40Mhz wide mode, the new AirPort Extreme has a maximum output power of 392.64mW, which is more than 2.8 times greater than the 139.32mW maximum output of the previous model. The details come from technical documents filed this week with the U.S. Federal Communications Commission. It was the FCC that first revealed the new AirPort Extreme, dubbed model A1408, before the hardware went on sale in Apple's store. The tweaked AirPort Extreme hardware became available on Tuesday, but Apple made no mention of the hardware upgrade. Its website does not reveal that the AirPort Extreme is a new model, or that it has 2.8 times more power output than its predecessor. AppleInsider spoke with the repair gurus at iFixit, who compared the two FCC certifications for the old and new AirPort Extreme. While it's impossible to tell exactly what kind of real-world improvements the new A1408 model might offer without testing, owner Luke Soules said the extra power in the new hardware will "definitely increase signal strength and range." Theoretically, and in a vacuum, a power increase of 2.8 would provide the same signal strength at 1.6 times the distance, he explained. But real-world usage will vary, and any performance boost could be minimal, perhaps explaining why Apple chose not to advertise the modifications. The new AirPort Extreme was released alongside a refreshed Time Capsule, which now comes in a higher capacity 3TB model for $499. With the new Time Capsule as well, Apple made no mention of any new features, and neither device is advertised online as "New to the Store." The release of the new AirPort Extreme and Time Capsule put to rest rumors that suggested Apple would switch the wireless devices to its lightweight iOS operating system, also found on the iPhone, iPad and new Apple TV. Apple's existing AirPort and Time Capsule products have for years used embedded ARM processors built by Marvell, but they run a unique embedded operating system, and there is no indication that the operating system has changed.